NORTH LIBERTY, Iowa (AP) -- After weeks of hype, former Texas Rep. Beto O'Rourke swung through Iowa for the first time and strode into the presidential race to larger crowds and more media attention than most others in the already crowded 2020 Democratic field. Until recently, O'Rourke was a little-known El Paso congressman whose views weren't well known. His campaign rollout filled in some blanks and gave him a chance to try to move past some flubs, such as quips about being a part-time parent. Still, he remains something of a political mystery. One of the big questions surrounding O'Rourke's candidacy is whether he'd be able to recreate the energy that fueled his political stardom during his 2018 challenge to Sen. Ted Cruz. O'Rourke's campaign said Monday it drew in $6.1 million in donations during its first day alone, or just more than the $6 million fellow Democratic presidential hopeful Bernie Sanders raised in the opening 24 hours of his campaign. That's a key indication O'Rourke can revive a deep, nationwide supporter base built heavily on small donors that helped him rake in $80-plus million while nearly upsetting Cruz. As he did while running for Senate, O'Rourke says he won't take donations from outside political groups, but he also won't rule out organizing fundraisers with high-dollar donors, as has another 2020 Democratic White House candidate, Elizabeth Warren. He said he'd support his campaign staff unionizing after Sanders' became the first presidential campaign to do so. And O'Rourke has pledged to release his tax personal returns — unlike President Donald Trump — but didn't say when. O'Rourke's six years in Congress encompassed little foreign policy experience, and it's showed at times. He said he supports a two-state solution to the Israel-Palestinian conflict, but when asked if he had an opinion about "Brexit," he answered simply, "No." If elected president, O'Rourke says he wouldn't send U.S. troops to Venezuela. Nor would he deploy them to Syria "without some declaration or authorization for force." He's also denounced China for manipulating international markets but hasn't said how he'd deal with that other than criticizing Trump's trade tariffs. Policy areas O'Rourke likes discussing are immigration and the U.S.-Mexico border. A fluent Spanish speaker, he hails from El Paso , across the Rio Grande from Ciudad Juarez, Mexico, which he calls the "world's largest binational community." O'Rourke says he knows more about the border that has dominated national debate than anyone running for president. During the Senate race, O'Rourke said he'd support Sanders' "Medicare for All" plan. Now, O'Rourke says he prefers a proposal by Democratic Reps. Rosa DeLauro of Connecticut and Jan Schakowsky of Illinois known as "Medicare for America." O'Rourke says it would allow people who already get health insurance from their employers to continue to do so while helping millions without coverage enroll in Medicare. When a man in Independence, Iowa, accused O'Rourke of siding with "insurance company greed," the former congressman responded with one of his common refrains: "If we become too ideological or too prescribed in the solution, we may allow the perfect to become the enemy of the good." Asked about the U.S. government making financial payments for centuries of stolen labor and oppression of enslaved black Americans, O'Rourke didn't directly answer. He said only that the nation had to confront the truth about its racist past. O'Rourke frequently jogged with supporters while running for Senate and seems poised to get plenty of exercise during the presidential campaign. He participated in a race in North Liberty, Iowa, running 5 kilometers, or about 3.1 miles, in 24 minutes and 29 seconds. He also chatted with fellow racers while doing so, saying talking health care helped speed him up. O'Rourke acknowledged being in pain toward the end of the race, but he called it a good "pressure check" on his body. O'Rourke likes to drive himself to campaign stops, often while livestreaming. He did this constantly as a Senate candidate, saying he can't stand to sit still. His presidential campaign used a Dodge Caravan to traverse parts of Iowa, then drive to Wisconsin, Michigan and Ohio with plans to head to Pennsylvania and New Hampshire. 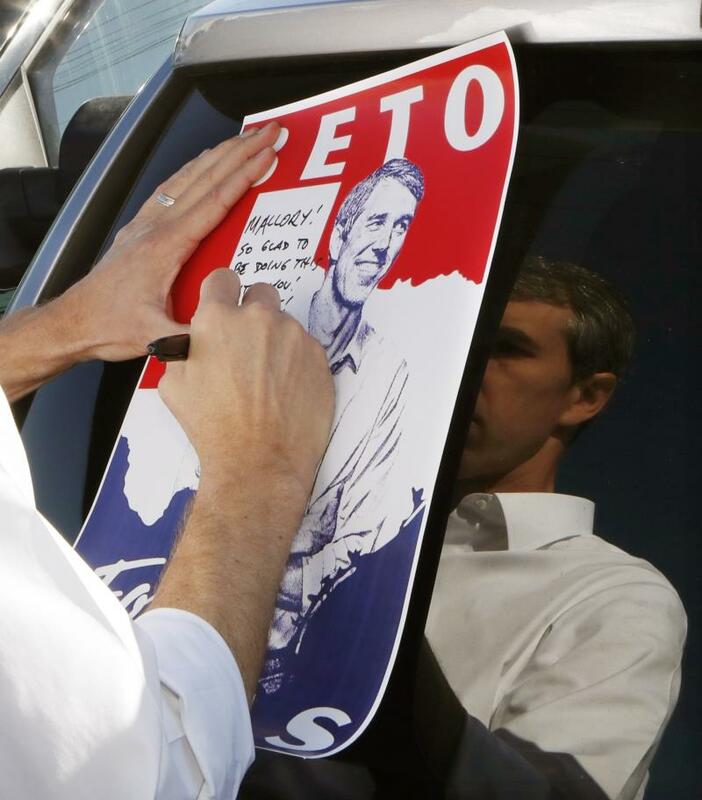 But O'Rourke has a tendency to speed — and to sometimes curse at other drivers — which can make for awkward internet moments. He's promised to clean up his language while running for president. O'Rourke could have the road to himself a lot. While other candidates, including the senators running for president, have day jobs, the campaign is O'Rourke's only occupation at the moment. Trump suggested O'Rourke constantly waving his arms might mean the Texan is crazy. Others picked up on how, during the online video announcing his candidacy, O'Rourke bounced so much on the couch where he was seated with his wife that she occasionally pitched forward, appearing to nod in agreement without actually moving her head. Those who knew O'Rourke before he was elected to Congress in 2012 say he used to be a stiff and little-animated campaigner — a problem he no longer has.